AdEdge Water Technologies, LLC. (AdEdge) was selected in 2004 by the U.S. EPA and the host site as part of the Round 2 Arsenic Demonstration Program to implement full scale arsenic treatment for the Chateau Estates Mobil Home Community in Springfield, Ohio. The public water system has approximately 230 connections with an average daily flow of 45,000 gallons per day. AdEdge was contracted by U.S. EPA to perform a turnkey project including design, fabrication, permitting, installation, and startup of the treatment facility. The host site was working closely with Ohio EPA (OEPA) to address the concerns of local residents to permit and implement a treatment cost effective solution as soon as possible. The AdEdge team prepared the design documents and obtained all regulatory permits from OEPA to install a two-stage treatment system to reduce the high iron and arsenic levels to below the new standards from the two wells serving the site. The system utilizes AdEdge’s AD26 and granular ferric oxide (GFO) adsorption system using Bayoxide E33®. Building and system upgrades were also performed prior to arrival of the equipment. The system was installed and placed into full time operation in September, 2005. The AdEdge arsenic treatment train consists of a completely integratedpackaged treatment system with two main modules to treat a 230 gallons per minute (gpm) design flow: an AD26 system for iron and manganese removal and an Adsorption Package Unit (APU) for arsenic adsorption, both skid mounted and automated to accommodate the design flow. The first module in the treatment train is the iron/manganese removal system, which consists of a triplex 30-inch diameter vessel system and AD26 media. 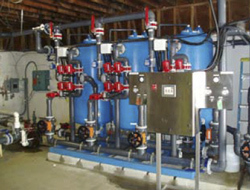 The AD26 system is augmented with chlorine feed module prior to the treatment system. This module injects, monitors, and controls free chlorine to enhance iron and manganese oxidation and subsequent filtration prior to arsenic polishing. The second component is an arsenic adsorption skid-mounted unit rated for 230 gpm also configured in parallel operation. Raw water is pumped from the two groundwater-supply wells through the AD26 pre-treatment unit, to hydropneumatic tanks, and then subsequently through the triplex APU adsorption system before entering the distribution. The 42-inch diameter APU vessels each contain Bayoxide E33® adsorption media. Bayoxide E33® also known as GFO has been in commercial use since 1999. AdEdge has used GFO media in over 100 small community and non-community public water system applications and in over 2,000 residential applications throughout the U.S. and Canada. The skid-mounted systems are equipped with automatic controls, backwashing features, switches, gauges, flow meters, and sample ports for complete functioning packaged units. A PLC and color touch screen interface allow for simple user access and operation. Since operations began in late September, 2005 treating approximately 45,000 gallons per day, results indicate excellent removal of iron from 1.1-1.6 mg/L to <0.03 mg/L, manganese to < 0.01 mg/L, and arsenic removal from 28 parts per billion (ppb) to below detection, < 2 ppb.